Surrogates are one of L’Atelier’s brands and rolled at the My Father factory in Esteli Nicaragua. My Father knows how to roll a cigar and L’Atelier is adept at finding delicious blends. So far so good. Surrogates gives each of its vitolas names. 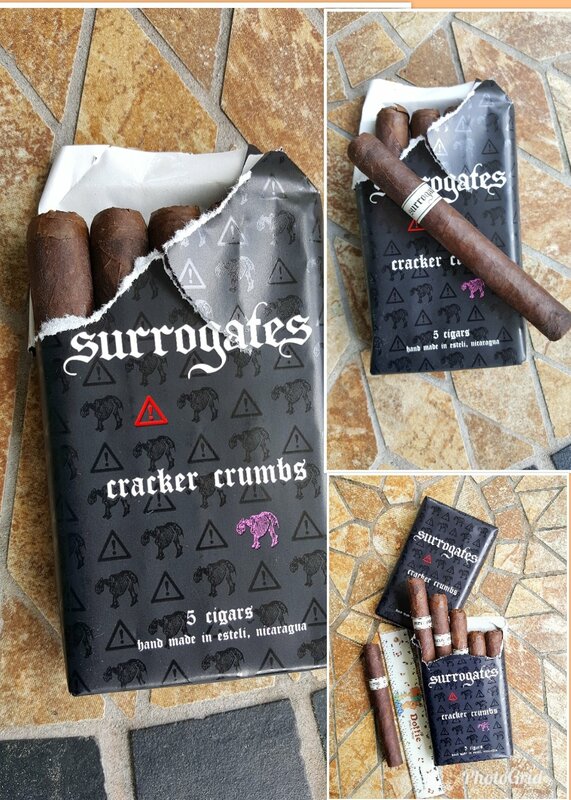 The Cracker Crumbs is a 4.5″ x 38 (so petit corona) version of the much larger (6″ x 60) “Animal Crackers”, a cigar I haven’t tried as that vitola is just way to big for me.. Cold Aroma: Very light. Some barnyard, something a little sweet (leather?). Nice but indistinct. Construction: This cigar is a little rough. a maduro-dark brown, easily visible seams, some prominent veins. Evenly packed though, and a little heavy, a somewhat dense cigar. Interestingly, the cigar is pre-straight-cut almost as though when L’Atelier got their order of paper wrappers (5 cigars to a pack) they were slightly too small and someone came up with the brilliant idea of pre-cutting the stick to fit. Pure speculation on my part. If you look carefully there is clearly a double cap at the head, so these were not made to be open like a cheroot. Meanwhile, the stick smokes beautifully and very slowly. Lots of creamy smoke, medium draw throughout, and an even burn requiring only occasional touch up. I’ve been through two packs of these and only a couple required any poking with a draw tool to loosen it a bit. Consistently smokes about an hour. Flavors: This is the best tasting cigar under $3 I have ever had. It begins with a little pepper, sweet woods, graham cracker, and evolves a little more sweetness and leather. On the tongue alone the flavors are muddled, but become distinctively sweet (along with more pepper) on the retrohale. The flavors evolve through the first half of the cigar, more maple wood sweetness and leather come forward, some roasted nut, and a little wintergreen. As the stick smokes down the sweetness fades a bit, the pepper comes forward, but the leather and scent of burning leaves remain. 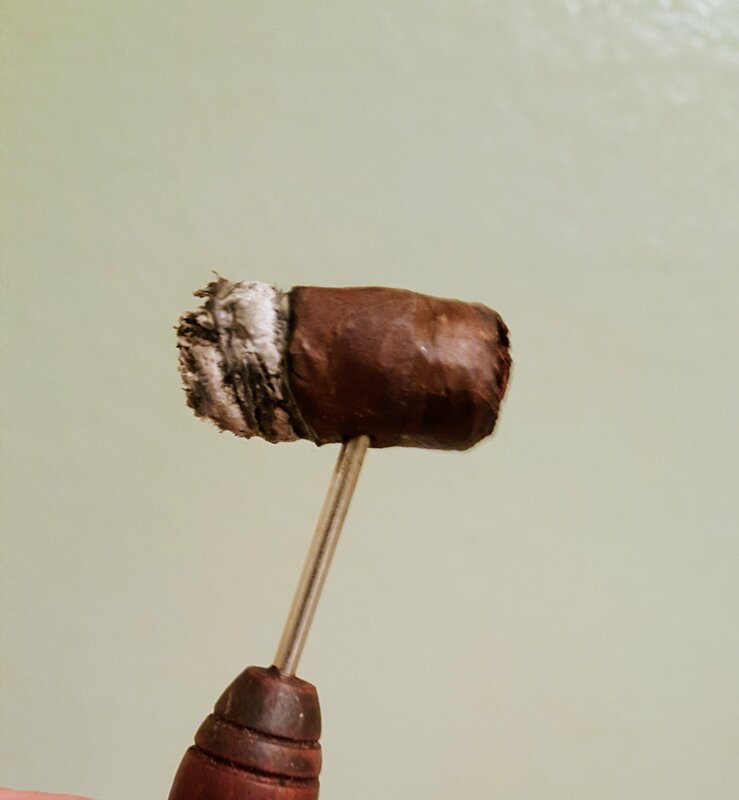 The cigar holds some flavors down to the last 3/4″ so all is good. Quine Atal Writer, editor, cook, programmer. I've worn a few hats and had a few adventures. Currently writing philosophy and blogging. Transplanted from the New York City to San Francisco back when that was in style. I tried many things, earning a Masters degree in philosophy (SFSU 1980), but learning to program ultimately determined my living. Marriage had its own effect on that direction.